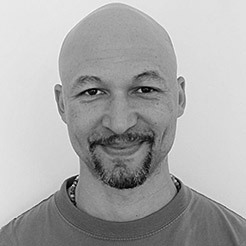 Joshua Bee Alafia graduated from UC Santa Cruz in 1995 with a BA in Theatre Arts/Film. He currently is a filmmaker and has worked as a teaching artist teaching film, capoeira, tai chi and mindfulness practice. He is a graduate of the Community Dharma Leaders training through Spirit Rock Meditation Center.